Skin and mucous membranes: Antiseptic. 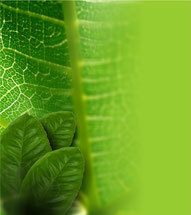 The high content of L-carvone transfers the characteristic smell of mint and its stimulating effects. It has been observed in vitro antimicrobial effects. 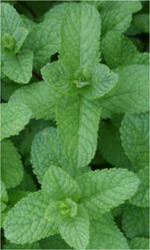 The Mint plant is insecticide and has neuro depressive effects in experimental animals, which are increased during sleep. 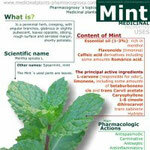 Mint preparations are indicated for digestive problems and as a remedy for flatulence. Peppermint essential oil is used as an aromatic in many pharmaceutical preparations, food and cosmetics like shaving creams and lotions, toothpaste and other oral products, among many other uses. Presents no health hazard or side reactions when used in the dosages specified as therapeutics. The Mint essential oil has a low potential for sensitization. Do not prescribe pure essential oil through internal via during pregnancy, lactation, children under six years, patients with dyspepsia hypersecretory or achlorhydria. Do not administer or topically applied to children under six years old or people with respiratory allergies or with known hypersensitivity to this one or other essential oils. The essential oil of mint can produce, in sensitive individuals, nervousness and insomnia. The dosage forms of non-encapsulated essential oil may cause people suffering heartburn in gastroesophageal reflux disease. Excessive inhalation of menthol products can cause nausea, anorexia, tachycardia, ataxia and other neurological disorders. Exceptionally, the essential oil of peppermint, can cause contact dermatitis. Mint Infusion: pour 20 to 30 g of fresh leaves in 1 liter of boiling water. Drinking 500-700 ml per day in 2-3 divided doses. This same infusion can be used for inhalation and applied locally, in the latter case, use 2-3 times daily directly to the affected area.